Summary: What if a beautiful vintage dress could take you back in time? Suddenly onboard a luxurious cruise ship a hundred years ago, Louise relishes the glamorous life of this opulent era and slips into a life of secrets, drama, and decadence. . . . Unless you've been living under a rock, then you already know that today is the 100th anniversary of the sinking of the Titanic. 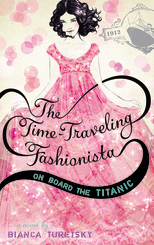 There are numerous books out there on the subject, but THE TIME-TRAVELING FASHIONISTA ON BOARD THE TITANIC by Bianca Turetsky is a very special one. I reviewed this novel last year (when it was titled THE TIME-TRAVELING FASHIONISTA), and I adored it. THE TIME-TRAVELING FASHIONISTA ON BOARD THE TITANIC is a great premise for a historical novel, and it also includes thirty full-color fashion drawings. It is truly a wonderful book for tween girls! I recently handed this novel to Booking Daughter since she is the target audience for the novel, and she absolutely loved it! In fact, she finished the book in just a few hours and then turned around and read it again. I think that's a pretty great endorsement of this book! In fact, she and I are both looking forward to the next novel in the series -- THE TIME-TRAVELING FASHIONISTA AT THE PALACE OF MARIE ANTOINETTE. To celebrate the 100th anniversary of the sinking of the Titanic, I have three copies of THE TIME-TRAVELING FASHIONISTA ON BOARD THE TITANIC to share with three lucky readers. To enter, just fill out the form below before April 20th at 11:59 p.m. ET. I will randomly select and notify the winners the following day. This contest is open to those of you with U.S. addresses only -- no p.o. boxes please. Good Luck! Ooohh...my daughter and I would love to read this one together. I had never heard of this series. My tween is very much a fashionista and I know she would love it. I bought this last night for Daisy Daughter, and by this morning, she was done! She loved every word! !